Lie on a flat bench with your feet flat on the floor while holding a barbell at your chest with an overhand grip. With your elbows bent and your upper arms aligned with your shoulders, raise the dumbbell so it's about 3 inches above your forehead. Extend your elbows while keeping your upper arms aligned with your shoulders. Straighten your arms until the barbell is directly above your face, making sure to keep your wrists aligned with your forearms during the entire exercise. Bend your elbows and lower the barbell toward your forehead using slow and controlled movements. Repeat for three sets of 12 repetitions. Stand with your feet hip-width apart, abdominals contracted, and your shoulders pulled back and down. Allow your arms to hang extended to your sides as you grasp a dumbbell in each hand with your palms facing inward toward your body. Bend your elbows until the dumbbell is near the front of your shoulder. Keep your elbows in a fixed position at your sides, so only your forearms move during the exercise. Slowly lower the dumbbells to the starting position. Perform three sets of 12 repetitions. Place two flat weight benches parallel side-by-side keeping the benches leg-length away from each other. Stand between the benches so one bench is in front of you and the other bench is behind you. Place your palms shoulder-width apart on the edge of the bench behind you and grasp the bench with an overhand grip. Extend your elbows. Position your heels on the bench in front of you with your legs together and straight. Bend your elbows to lower your buttocks about six inches from the floor and hold this position for one second. Raise your body to the starting position by extending your elbows. Perform three sets of 12 repetitions. Stand with your feet hip-width apart and your shoulders pulled back and down. Hold a barbell using an underhand grip that's shoulder-width apart and extend your arms to the front of your thighs. Keep your elbows in a fixed position close to your body during the entire exercise. Bend your elbows to raise your forearms and bring the barbell to your chest. Hold this position for one second. Lower your forearms by extending your elbows using a slow and controlled motion. Lower your forearms until your arms are fully extended and the barbell is in front of your thighs. Repeat three sets of the 12 curls. Choose a weight that's heavy enough to fatigue your muscles by the 12th repetition. 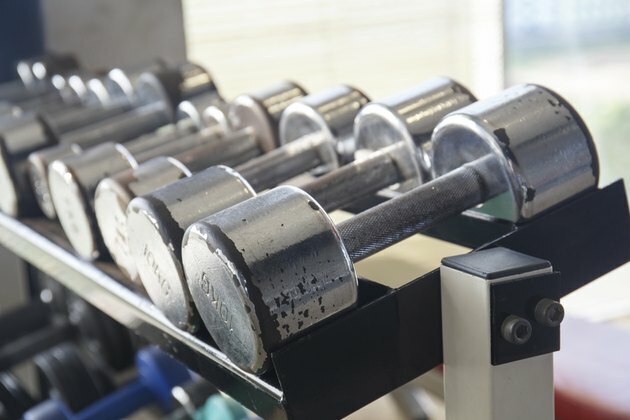 If you could easily perform additional repetitions, it's time to add more weight. It should be nearly impossible to complete your 12th repetition. Exercises using a barbell can be substituted with dumbbells and vice versa. Add 150 minutes of weekly moderate-intensity aerobic activity to your strength training routine to burn fat while toning your muscles. Once you've completed these exercises, rest your upper arms for 24 hours before repeating the exercises. Perform these exercises three times per week. Performing exercises incorrectly increases your risk for injury to the muscles or joints. A personal trainer can monitor your technique to ensure you're performing the exercises correctly.